Even though CouponApp might seem as a useful add-on because it claims to be able to provide you with various coupons and discounts, the truth is that it is not going to act like this because it is just a simple advertising-supported application. It can be suggested that its main purpose is to advertise particular products and services and probably even generate money for the publishers. As you can see, CouponApp is not ready to enhance your browsing experience by doing something useful, which is why you should better remove it from the system. If you read throughout this article, you will definitely find out everything about the removal of this adware. There are several undesirable features of CouponApp that helped us to arrive at a verdict that this software is unreliable. Firstly, it has been found out that all those commercial ads that will appear on your screen are very intrusive, which mean that your daily browsing habits might be disrupted. Secondly, it has been observed that this program collects different kinds of information associated with your activities on the web. If you still wonder what this means, you should know that it is very probable that the websites which you visit, search queries, the content which you access and other similar information is recorded and the only way to prevent this from happening is to get rid of CouponApp entirely. Finally, it might even expose you to threats if you keep clicking on those ads. 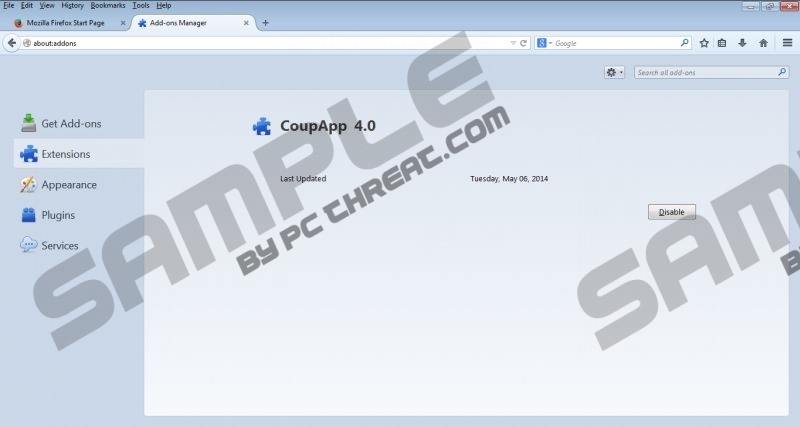 The specialists of pcthreat.com have also revealed that CouponApp might be associated with other applications because it tends to be distributed attached to them. Not all these programs are reliable; thus, you should better delete unknown programs from your computer. Of course, you should check whether it is not a system file first. Do you seek to protect your system in the future? Thus, you should always complete the installation of new applications very carefully. Besides, you should never skip the installation steps. If you want to stop all those commercial ads from appearing, you should definitely remove CouponApp from your system. It can be done manually or automatically; however, you should know that an automatic removal is the easiest method because you will just have to launch the scanner. Of course, you can delete the application manually by using the instructions that we have provided for you below. Do not forget to keep your security tool enabled in the future in order not to allow different kinds of unwanted programs enter the system. Click Add or Remove Programs and then locate the undesirable software. Click Control Panel and then access Uninstall a program. Right-click on CouponApp and then delete it. Click on the unwanted program and then select Uninstall. Quick & tested solution for CoupApp removal.